AFL Asia has, I believe, nominated Team IndoChina to contest the International Cup 2017 in Melbourne, in August 2017. Indonesia (Garudas) and China (China Reds) and Team IndoChina played each other in a Round Robin contest for the Inaugural All Asia Championship. China is a fully ranked nation whilst Indonesia is provisionally ranked, now only one game away from becoming fully ranked. Team IndoChina debuts with 40 Rating Points. Below are the rating points changes of the three “nations” from the three All Asia Championship Matches. 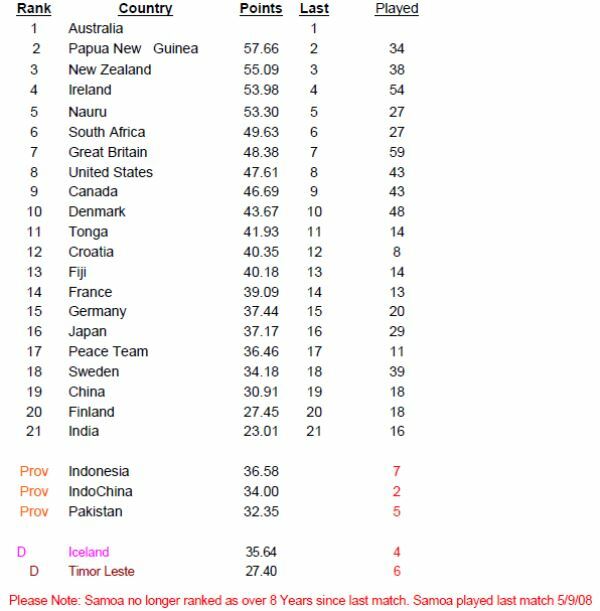 Also the rating points changes for the Ireland v Great Britain International test match played last weekend in Dublin, Ireland. Note also no actual changes in ranks occurred as a result of all these matches.